The link between North and South between Washington and Richmond. Many steam locomotives were named after Southern Governors and Confederate Generals. 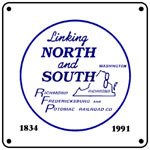 6 inch x 6 inch square tin logo sign of the RF&P Railroads Link image. 6 inch x 6 inch square tin logo sign of the RF&P Railroad. 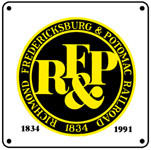 6 inch x 6 inch square tin logo sign of the RF&P Railroad used during its steam era.